This is the truth about Grace Kelly. It has been a truth hard to come by. To try to capture the essence of this strange and contradictory personality who, at this moment, is the most celebrated woman in the world, has been the most difficult task of my life as a writer. Trying to see her steadily and see her whole, trying to get her image into clear focus, trying to fix her on paper the way a lepidopterist might pin a rare butterfly on a card, has been like trying to clutch a handful of mercury in a fist or to seize a lovely summer cloud in a net. To get at the truth, to understand the truth, has been very hard for me. 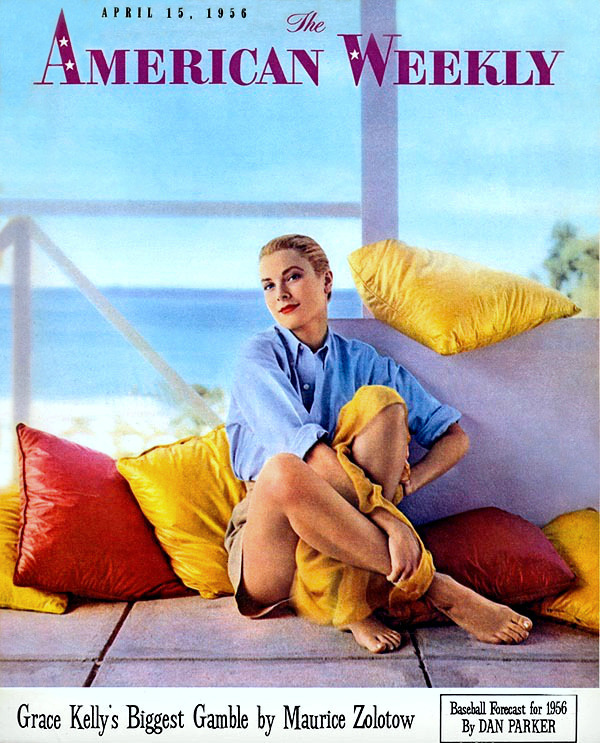 OUR COVER: Photographer Howell Conant says this picture 1) was snapped on his first Grace Kelly assignment** and 2) is one of the rare bits of “leg art” she ever posed for. Conant and Kelly, incidentally, hit it off fine. He’s even been asked to the wedding this Wednesday. This tall, graceful and slender woman of 26, who will become the wife of one of the world’s last absolute monarchs within a few days, has deliberately discouraged people from knowing her all her life. Rainier III, ruler of the principality of Monaco, may think he knows her but I do not believe he does. I believe that he will know her someday. And I believe that he will be startled, shocked and perhaps exhilarated when he discovers the reality of her character. It will not happen quickly, not in a month or in a year. Prince Rainier Grimaldi has elements of sensitivity in his own personality and he will need all his sensitivity, all his awareness, to grasp the subtleties of this elusive Venus de Philadelphia. That she is in love with him I have no doubt. She is madly, passionately, violently, romantically in love with him. I remember an evening in Los Angeles, this past January, when we were sitting at dinner. The telephone rang. She put down her fork and flew from the table. She turned her head for a moment. “I think it’s him,” she said. “I’m expecting a call from him.“ Prince Rainier was in Palm Beach. She closed the door to the bedroom. She spoke to him for 22 minutes. When she returned to the living room her big blue eyes scintillated with excitement. She was breathless. A rosy glow colored the flesh over her high cheekbones. There was an air almost of ecstasy about her. She is giving herself to her husband with a wild, intense emotion, all the wilder because she is a woman who has always controlled her emotions, always concealed her thoughts and feelings from the world, from her parents and from even her closest friends. But a marriage to Grace Kelly cannot be a simple situation. The story of her life, I believe, will not end with, “And they lived happily ever after,” like the ending of the story of the sleeping beauty who was stirred into life by her prince charming. The prince, in this case, is certainly very charming, and the beauty has indeed been slumbering for a long time. When the solemn marriage ceremony is concluded, when the Bishop of Monaco has pronounced them man and wife and the ball is over and the last of the fireworks has died out, and all the wedding guests have said good-night, and the Prince and his Princess shut the door and are finally alone, that is when the real challenge to both of them as human beings will have to be faced. How they will resolve their deep dilemmas will be as fascinating as any motion picture in which Grace Kelly has ever starred. At this moment Miss Kelly, I know, is quite certain that she will never act again. She foresees a future for herself as the chatelaine of a castle and the mother of a large family. She loves children. She will be an adoring and thoughtful and devoted mother. 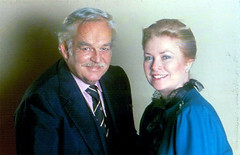 Until she fell in love with Prince Rainier last December, she felt secure emotionally only when she was playing with children; the children of her older sister, Mrs. George Davis, or the children of her old friend, Mrs. Malcolm Reybold. She feels safe with children and with animals. Grace Kelly has almost a terror of looking like a fool, of being rebuffed by people. An actor who worked closely with her in a film told me, “She goes to incredible lengths to avoid any situation in which there’s even a remote possibility that she might be rejected. She doesn’t trust people. She is afraid of looking stupid. That’s why she doesn’t talk very much. 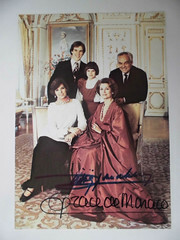 I believe that the first crisis which Mr. and Mrs. Grimaldi will have to face is the issue of her career. The Prince believes it is beneath the dignity of his consort to play in motion pictures. To his mind it is wrong, socially and morally, for the wife of a rich European noble to earn her living by the sweat of her beauty. In the European ideology, toiling is suitable only for the wives of peasants and shopkeepers. “Will you go through with the role in Designing Woman?”, I asked. This movie, a musical film about a clothes designer, is scheduled to get underway in June. The picture, High Society, in which she co-starred with Bing Crosby and Frank Sinatra and which may be her last picture took less than three months to make. Oddly enough she starred in this film with the prophetic title after completing The Swan in which she becomes the bride of a prince (Alec Guinness) and shares his throne. Well, 48 hours after Miss Kelly made her views clear to me, her future husband came on the scene. At a press conference, he announced that his future wife would not be making any more films. I have been told that he did not discuss the problem with her before issuing his pronunciamento. Whether or not the shining star of the Metro firmament knows it, she is about to marry a real prince, not a character out of Blossom Time. He obviously is a young man of determination and will. After Prince Rainier ended his fiancée’s artistic career with a stroke of his tongue, Miss Kelly informed the press that yes, of course, she would never act again if that was how her husband wanted it to be. She means it, too. She is in that first fine careless rapture that many a bride-to-be has experienced. But all honeymoons, even those of beautiful movie stars and handsome princes, must come to an end and the lovers settle down to the complicated business of living. The impressions that Grace Kelly gives to everybody are quite deceptive, and that is why almost everything that has been written about her in newspapers and magazines has presented a blurred and distorted image of the person she really is. The poise, the glacial dignity, the sophisticated aloofness, the dignified smile and the long white gloves, all this is a mask that conceals a frightened and tremulous little girl unsure of herself, full of anxieties, struggling with her fears. Against the stereotype of the cold and worldly female who stands aloof, I remember two unguarded and revealing moments. The first was a morning on Stage 27 on the Metro-Goldwyn-Mayer lot in Culver City. Incidentally, the M-G-M studios sprawl over 175 acres, about half the size of Monaco’s 370 acres. And when Metro production is running in high gear, the population of this principality is over 4,000. The normal population of Monaco is about 20,000 and of these there are only about 3,000 natives. Yes, Grace Kelly has already had some experience at reigning over a small-sized empire. Well, on this particular morning, they were shooting a scene for High Society. It was a scene in a. library. There is a bar in this library. Grace Kelly is standing behind the bar. Frank Sinatra, who plays a magazine writer, is in front of the bar. She is pouring him a glass of champagne as he discusses the many facets of her personality. Finally, he sings a song to her. The stage was crowded with stagehands and electricians and soundmen. Cables snaked over the floor. Director Chuck Walters was giving directions and all the people – the assistant directors, the make-up man, the hairdresser and the onlookers – were clustered behind the camera. I was standing behind part of the scenery watching Miss Kelly and they kept shooting the same scene over and over. From the front she looked suave, self-contained and superior. But after every take she turned her back to the spectators, heaved a tremendous sigh and took a deep breath. Before turning around she pressed her hand on her stomach very tightly, and the expression on her face was one of uncertainty and fright. And then, in the moment before she turned around to face the camera again, she wiped away the anxiety and showed us all a calm and placid face. There was another moment that remains vivid in my memory. It happened one night when I was visiting her at home and we had talked for many hours. When it was time to go, she walked me outside to the car. She shivered a little in the cold evening air. I looked up at the sky. For day after day, almost a week, Los Angeles had been lashed by blinding rains. Many parts of the city were flooded. During this evening it had suddenly stopped raining. “The stars are out,” I said. “I’m sorry,” she said. “About what?”. How did it happen that this shy, sensitive girl, who prefers the dark to the light, and the rain to the sunshine, who likes to be by herself and to walk alone, came to plunge herself into a way of life that put her in the glare of the public eye? I’ll try to offer some answers to this question in the course of these articles. 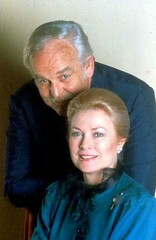 As a detached and sympathetic observer of the psychological conflicts and the intense struggles which Grace Kelly has experienced in order to carve out her great achievement as an actress, I do not believe that she can be happy unless she continues to do the work that has come to represent for her the special and private fulfilment of all her creative desires. She is a woman and, being a woman, she wants to know the warmth and protectiveness that a husband can give. She wants to bear children and rear them with tender loving kindness. But Grace Kelly is also an American career woman who has demonstrated that she possesses a special gift for creating haunting moments of tenderness, laughter and sadness on the screen. As we explore her past life, we shall see why this need to achieve artistic fulfillment is of crucial importance to her. 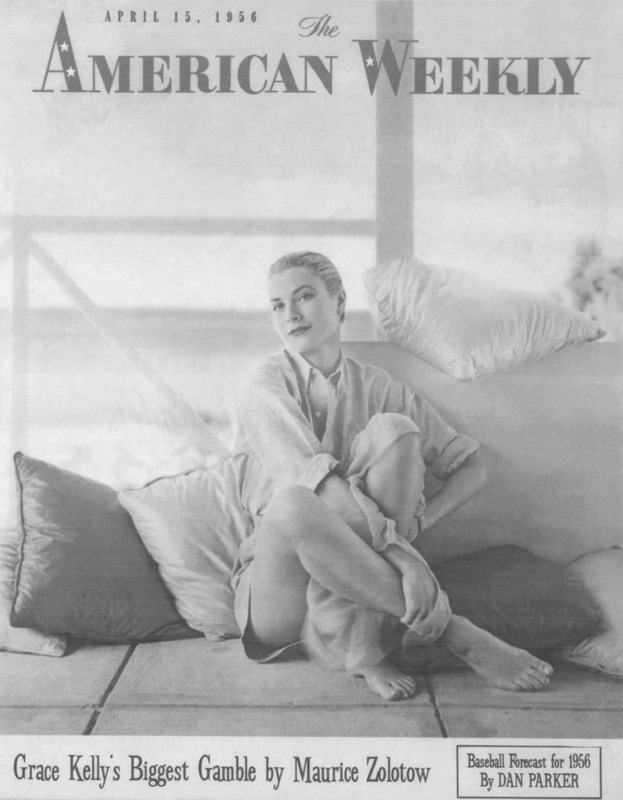 Acting, for Grace Kelly, symbolizes the solid ground on which she stands with her own two feet. It represents her triumph as a human being, her victory over all the doubts and insecurities that have haunted her life since childhood. To turn her back on all this, I believe, would be a terrible defeat for her. It would be like cutting the heart out of herself. Ironically enough, I think she will be a poor wife for the Prince if she cuts herself down. I cannot see her getting any lasting satisfaction out of leading the empty and uncreative life of a royal consort, rattling around in a 200-room palace, her children managed by nurses and governesses. Sooner or later, boredom will set in. “Do you think Grace Kelly will give up being an actress?”, I asked. 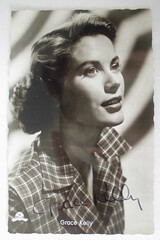 Rita Gam, Grace Kelly’s closest friend, also believes that Grace will turn her back on the glory of Hollywood. She also believes that Miss Kelly will be exuberantly happy in her new way of life as Her Serene Highness, the Princess of Monaco. “You really think she will be happy?” I said. “Do they really have much in common?”, I asked. “I think he does love her and respect her,” Miss Gam said. The conflict of standards between European culture and American culture may never arise between Grace and her husband. And if it does, he may be able to overcome his background, his system of prejudices and values, so that he can understand his wife’s need to have some validity independent of himself, to want to be something else besides Her Serene Highness, the Princess of Monaco. For, after all, creative genius is such a rare and fragile thing that it would be a sad thing to deprive her, and us, of her talent forever. Like his future wife, Prince Rainier III is a person of contradictory and elusive qualities. We shall explore the backgrounds of them both in finer detail in later portions of this story. At this moment of writing, I do not feel that they know each other deeply. The courtship was quick and climactic. There was a brief meeting at the palace in Monte Carlo last spring. And then the Prince came to the United States in December. During the whirl of Christmas and New Year’s parties and social engagements, they fell in love and he asked her to marry him. It all happened in less than two weeks. Grace’s character is such that she has been cautious in every step of her life but she has taken a tremendous step on a sudden impulse. She opened herself to another human being as she has never done before and she did it abruptly and passionately. It was a romantic gesture. But I can’t help thinking that there still remain large areas of ignorance about each other separating the imperious young Prince of Monaco and the beautiful, talented American girl behind the mask.